Item is a portrait of woman. Text in blue ink below photograph reads, 'Kellie & Co. Portraits'. Inscription in pencil on back of card reads, 'Emily Rae'. Item is a carte de visite portrait of a young girl in a photography studio. Inscription on verso reads 'Florence Rose Orr - 6 years old - 30th July 1881. Made by Notman & Sandham, Montreal. Item is a carte de visite portrait of male with a beard wearing a bowtie. Item is a cabinet card portrait of male in graduate costume. Made by Wm Notman & Son, Montreal. Item is a carte de visite portrait of man standing in a portrait studio. Made by Notman, Montreal. Item is a carte de visite portrait of man standing in a photography studio. Made by Notman, Montreal. Item is a carte de visite portrait of man sitting at a table in a photography studio. Made by Notman, Montreal. Item is a carte de visite portrait of man standing in a studio beside a chair and table. Made by Notman, Montreal. Item is a cabinet card featuring a portrait of young female in graduate costume. Made by Wm Notman & Son, Montreal. Item is a yellow cabinet card with gold letterpress at bottom, reading "H. Dagenais/ 542 Lagauchetière St./ Cor. St. Lawrence/ MONTREAL." Photograph shows a woman in a black dress with a high lace collar. Item is a brown card with photograph pasted in centre oval, with light brown border around the oval. At lower left, embossed in white, "Noble & Pottenger/ WICHITA, KAS." Photographs hows two young men in suits, same as in 2008.001.111. Item is a bi-fold card with grey card and silver embossed key design at top. Inside photograph of a young woman with a short, bobbed hairstyle. In black letterpress at bottom of inside card, "Portrait by Fulton C. Stewart, Lindsay, Ont." Item is a bi-fold card with mottled green pattern and embossed floral decoration at upper left. 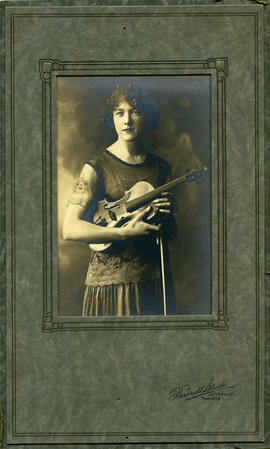 Inside portrait of a woman holding a violin. In black letterpress, at bottom inside "Herbert E. Paige/ 259 1/2 YONGE ST./ TORONTO"
Item is a white carte de visite with purple border and photograph of a girl holding a carte de visite album on her lap, closed. On verso, in pencil, "S. Francis/ Lindsay"
Portrait of John Akin, Esq. Item is a brown carte de visite with raised oval print in darker border. Woman in photograph wears a large beaded necklace with a corss. On verso, in black letterpress, "D. FERGUSON,/ Photographer,/ STRATHROY, ONT./ No..."
Item consists of a green card with thin beige border and photograph of a young soldier in uniform. At bottom right of card, embossed in silver, "BURGESS/ MITCHELL ONT." Item is a portrait printed on textured art paper of a man seated in a window with his arm around a woman standing beside him, looking out the window. Posed artistic portrait.